An Orca whale enjoys surfing in the wake of a boat and provides onlookers with a close-up view as she comes up for air off Vancouver Island. A killer whale off Northern Vancouver Island in British Columbia, Canada takes pleasure in surfing in the wake of boats. Seeing this type of behaviour from a whale is unbelievable to watch and gets your adrenalin going plus you get a magnificent view of these incredible mammals. In this particular photo the whale lets you have an excellent look at the front half of her body including the eye patch, blowhole, dorsal fin and the white underside of the whale's head. Nobody really knows why an Orca whale likes surfing but if you are lucky enough to see a majestic mammal like this female whale perform for you make sure you have your camera fully loaded and ready to go. Whale watching trips are different every day and you can never be sure what to expect from the Orcas as they are wild marine mammals and only they know what kind of mood they find themselves in. 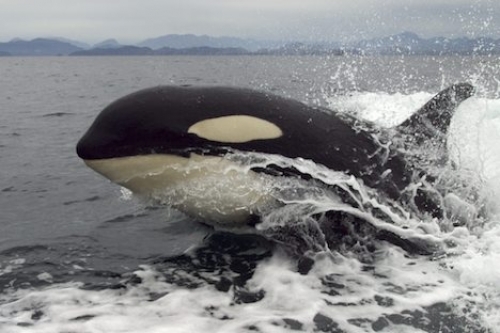 A Killer Whale's behaviour consists of many different characteristic traits such as feeding, resting, breaching, spyhopping, surfing, tail slapping or simply just swimming leisurely through the water.